From 1910 to 1940, immigration officers on Angel Island processed around one million Asian immigrants, many of them who spent months or even years waiting to be admitted to the United States. Asian immigrants have a longer history in this country than many people realize. The first recorded Asian Americans were a group of Filipino sailors who settled in Louisiana as early as 1763. In the 1800s, Chinese and Japanese immigrants came in larger numbers, many of them to work in mining or on the transcontinental railroad in the West. Although this nation benefited from their labor, Asian Americans and Pacific Islanders - or AAPIs - were not always welcome in the United States. In 1882, Congress passed the Chinese Exclusion Act - the first law in the U.S. to deny immigration to a specific ethnic group. The Angel Island Immigration Station was built specifically to monitor the flow of Chinese immigrants entering the country after this exclusionary law went into effect. When Congress passed the Immigration Act of 1924, it included the Asian Exclusion Act. This Act established quotas limiting "undesirable" immigration from Asia and barred Asian immigrants from naturalizing. It wasn't until 1952 that Congress nullified all anti-Asian exclusion laws and allowed Asian immigrants to become U.S. citizens, and it wasn’t until 1965 that the race and nationality-based quotas were lifted. That change led to a distinct increase in the number of Asians immigrating to the United States. Attendees then heard special remarks from Felicia Lowe, an award-winning producer, director, and writer. Ms. Lowe is herself a descendant of Angel Island detainees, and has been heavily involved in the preservation of the Angel Island Immigration Station. Among her many works is Carved in Silence, a documentary about the experiences of Chinese immigrants detained on Angel Island. After the ceremony, the new Americans toured the facilities on the island. There are hiking and biking trails, campsites, a snack bar and limited tram service. Angel Island is the largest natural island in the San Francisco Bay. The earliest inhabitants were the Coast Miwok people. Other local Native American tribes hunted and gathered food there. Spanish explorer Juan Manuel de Ayala stopped for supplies while he was mapping San Francisco Bay. Camp Reynolds was established on the island in 1863. In 1900, the name was changed to Fort McDowell. The fort played an active role during both world wars. When the Army no longer needed the post, the flag was lowered for the last time on August 28, 1946. 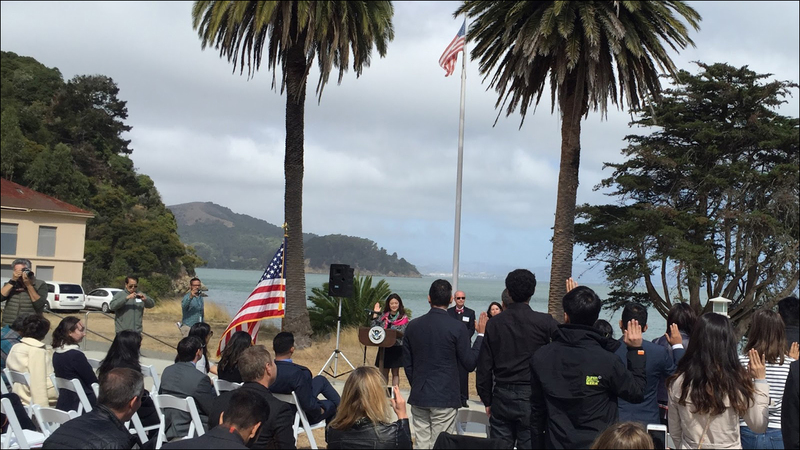 But on September 12, the flag was flying proudly as USCIS welcomed those that came to Angel Island as citizens of different nations, but left bound in their commonality as new U.S. citizens. This post was originally published on The Beacon, the official blog of USCIS.